When I first read the inside cover of this book, I knew it was one I wanted to read. I have always been fascinated by that Prohibition era. The background reminded me of The Great Gatsby, one of my favourite books. I remember the wild parties Jay Gatsby held and the parties in this book were similar. The book starts out with two best friends, Cordelia and Letty, leaving their small town to head to New York City. Letty wanted to be a star and Cordelia had her own secret agenda of finding her long lost birth father. The book started out really good and it didn’t take me long to get into it. I followed Cordelia and Letty’s arrival into the Big Apple and their first night at a speakeasy. Then it just started to go downhill for me. Cordelia and Letty got into a fight outside the speakeasy when Cordelia filled Letty in on her birth father and who he was (an infamous and very rich bootlegger). Letty freaked out and got mad and then Cordelia stormed off and just left her there. I should mention that at this point they had nowhere to stay. I just couldn’t wrap my brain around this happening over something that Letty should have understood. It made me think they couldn’t have been that good of friends to leave each other alone in the middle of night with nowhere to go in a big, unfamiliar city. Another part I didn’t really get was Cordelia meeting her birth father for the very first time. He welcomed her into his home without blinking and embraced her right away as part of the family. I would have thought he would have checked her out to see if he was lying especially since this is a guy with a lot of enemies. 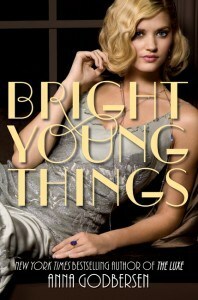 I think the author did a great job describing the 1920s setting. I enjoyed reading about the clothes and the way things worked back then. However, I found myself as I was reading through not really caring too much what happened to any of the characters. It’s the first book of a series, but I don’t think I would even bother reading the second one. Don’t Miss Out on My November Advertising Promo!